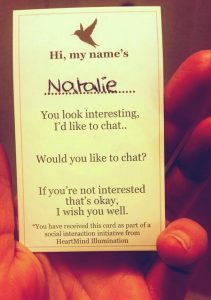 This week I was fortunate enough to strike up a chat with Natalie Swedosh about her Strike Up A Chat social interaction initiative. 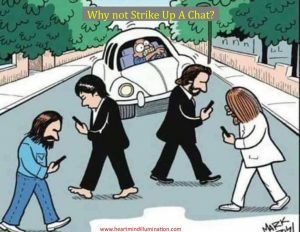 What is Strike Up A Chat? Strike Up A Chat is a social interaction initiative designed to help women and men reconnect in person. 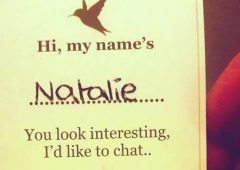 Creator, Melbournian Natalie Swedosh hopes that through striking up a chat with a complete stranger, we will rekindle the art of conversation and foster respect and connection between men and women. Her vision is to create a global epidemic of spontaneous chats to enrich people’s lives and instigate social change. Strike Up a Chat involves randomly selecting men (initially) aged 18 to 80, from different cultural backgrounds, places and suburbs, to chat with about how they are finding face-to-face communication with females. ‘I’m interested in knowing if the men I speak with have approached a female for a chat when they have been out, what their intention was and how it was received,’ Swedosh said. These chats often explore topics such as the high suicide rates for males and high domestic abuse rates for females, and what we might do to address and reduce these. In the process, Swedosh hopes to spread a few seeds and grow awareness about how we are all affected by society’s expectation and unwritten rules about gender roles – how we should act, what we should think and feel. Swedosh said she is curious to see the different responses she gets once she expands her conversations to men and women. How did Strike Up A Chat come about? 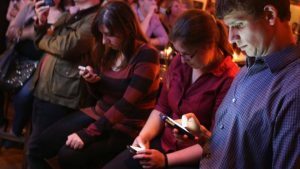 For some time, Swedosh had been lamenting the lack of conversation and connection between men and women, and the alarming trend for people to spend more time on their phones than engaged with the people around them. Swedosh feels the less we connect with people in real life, the more silo-ed, polarised and cliquey we become, with less community and inclusiveness. Recently, Swedosh delved a little deeper into the literature on domestic violence through her tertiary studies and volunteer work for the Women’s Information and Referral Exchange Inc. (WIRE) in Melbourne, Australia, which helps provide women with information, support and referrals. ‘It really got me thinking about men and women, masculine and feminine, and how estranged we are in our society. I was already aware through my Facebook feed of how isolated men have been, particularly from having direct involvement in the #metoo movement. I noticed how often when men commented on any of the feeds, women tended to shoot them down.’ She began to ponder how in this fractured cultural divide we could all become involved in creating change. It was also clear the conversation had to move beyond the virtual online world, and involve person-to-person interaction. ‘There’s something quite magical about connecting in person, the nourishing ineffable quality that seems to arise between men and women—it’s mutually rewarding,’ she said. That’s when she got the idea for Strike Up A Chat. How has Strike Up A Chat been received? So far, Swedosh’s experiences on the street have all been positive. ‘I’ve been steeling myself for knock backs, but so far the men have been receptive and delighted to be included in this conversation. A big part of that has been because I’ve shut up and let them speak,’ she said. Another challenge has been finding men who aren’t too engrossed with their phones to respond, but she has pushed through, with success. ‘Sometimes I’ve walked away from those chats feeling so nourished and energised from the sharing of thoughts and ideas, especially the conversations around what we can we all do, not just men, not just women, but everyone. It makes me feel like I’m part of something much bigger,’ she said. So far, Swedosh has been flying solo in her Strike Up A Chat efforts, but she hopes the movement will spread. ‘I wanted to try it by myself first, to test the water, and to establish some communication guidelines about active listening and being respectful, even when someone’s point of view is different to yours or you don’t agree with them,’ she said. She hopes as she documents her experiences more people will get involved, including all genders and identities. ‘Whatever community you’re in, everyone is invited,’ Swedosh said. Get involved in Strike Up A Chat by contacting Natalie through her Facebook page, where she can chat to you about some basic guidelines for effectively and respectfully striking up a chat. Natalie Swedosh is a counsellor and clinical hypnotherapist from HeartMind Illumination. She regularly hosts group meditations and workshops to enhance wellbeing and build community. This entry was posted in Editorial, Relationships, Single Life and tagged communication, connection, conversation, interaction, isolation, loneliness, social change, Strike Up A Chat. ← previous My boyfriend has transgender friends - does he want to be with one again?